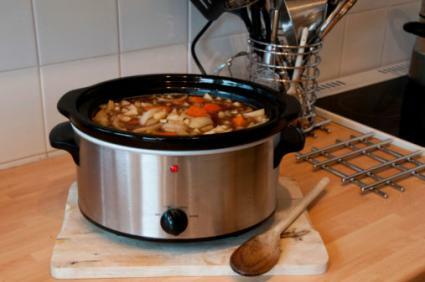 Crock pots, also known as slow cookers, have a reputation of being economical and energy efficient devices, but according the University of Connecticut Cooperative Extension, the average crock pot uses roughly the same amount of energy to cook a meal as the average oven. However, there a several variables that determine the efficiency of various cooking devices and, in some cases, slow cookers can be a very energy efficient choice. The Hamilton Beach Stay or Go 4-quart slow cooker is rated for 195 watts. The West Bend Oblong slow cooker with a 5 quart capacity is rated for 220 watts. The Kenwood CP657 slow cooker with a 6.5 quart capacity is rated for 320 watts. Most crock pots have multiple settings (high, medium and low) that keeps the device at different temperatures depending on your needs. The lower the setting, the lower the wattage. Since most crock pots give only the maximum wattage in their specifications, you can use a wattage monitor to determine how much they are actually using on a given setting. Plug the slow cooker into the monitor and then plug the monitor into the wall. It has an LCD screen that displays the amount of energy being used. Some crock pots are designed for better energy efficiency, so you will use less energy to do the same amount of cooking. One way to know if a slow cooker is energy efficient is to look for an energy star label. Some crock pots come with a built-in temperature sensor for meats, which switches the device to a 'warm' mode once the desired temperature is reached -- a feature that saves energy by not cooking the meal longer than necessary. Electric ovens run at anywhere from 2000 to 3000 watts, but they have a built-in thermostat that cycles the heating element on and off as needed. Crock pots use less electricity than electric ovens per hour, but because you have to cook things for longer, the energy savings generally cancel out. It's not difficult to gauge whether a particular cooking device is using more or less energy than another. You can use a wattage monitor to find the actual energy use on a given setting, or you can look to the label on the or the owners manual for the general wattage. Then it's a matter of doing the math. If your crock pot pulls 200 watts and it takes 6 hours to cook a meal, that's 1,200 watt-hours of energy. If your electric oven uses 2,000 watts, but cooks the same meal in two hours, that's 4,000 watt-hours. Since electric ovens cycle on and off with a thermostat, you need to multiply that number by the percentage of the time that the unit is actually drawing a current. You can do this by listening closely to the device -- you will hear a buzz when the heating element comes on. If it comes on 25 percent of the time (a typical ratio), you would multiply 4,000 times .25, which equals 1,000 watt-hours -- slightly less than the slow cooker. Power companies sell electricity in kilowatt-hours (kwh), so you can even look on your bill to see what your savings would be. One-thousand watt-hours equals 1 kilowatt-hour. Many factors come into play in determining whether a crock pot or an oven is the most efficient device for cooking a meal. How much you're cooking - Ovens can fit substantially more food than a crock pot, so if you're cooking multiple items at the same time, an oven is clearly more efficient. The type of oven you have - Convection ovens and self-cleaning ovens are more efficient than typical electric ovens. How you're using the oven - Opening the door a lot to check the food cuts down on the efficiency of the oven. Ranges versus ovens - Cooking on a range top is generally less efficient than using a slow cooker because there is no form of insulation holding in the heat. Because of their low wattage, slow cookers get a lot of attention as an energy efficient way to cook. Unfortunately that doesn't always pan out when you consider how much longer they take to cook things. However, they do encourage one-pot meals, which are inherently energy efficient when compared to a multi-course feast that uses several burners and an oven to prepare.